If you’ve got an eye for fashion, are a self-starter and are motivated with a drive for success, starting a fashion & retail business is a fun and exciting way to break into your own business. The fashion and retail industry is an extremely competitive market that can reap huge rewards once successful. The employment within the fashion and fashion related industries within the UK stand at 555,000 people employed. As seen in the pie chart below, most jobs in fashion related industries are in the retail sale of clothing. This sub industry employs 75 percent with 414,000 people working in the retail sale of clothing. 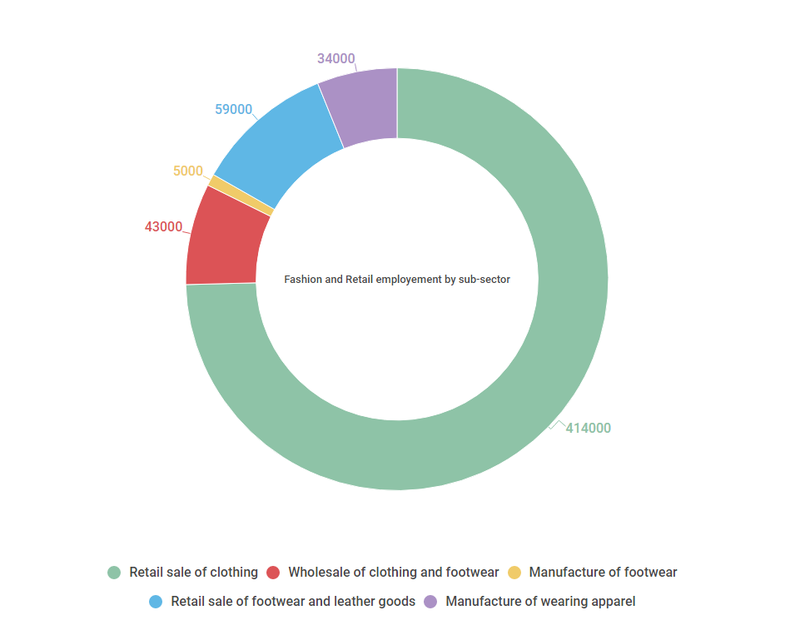 The retail and sale of footwear and leather goods further provide a fair amount of jobs in fashion, about 11 percent,59,000, employers work within this sector. Another 8 percent, 43,000employers, work in the wholesale of clothing and footwear. With respectively 34,000 in 5,000 positions, 6 percent and 1 percent, the least amount of jobs are in the manufacturing of wearing apparel and the manufacturing of footwear. Worth £60.2bn in 2015, the fashion industry grew at a compound annual growth rate of 4.3% during the previous five years but saw a major slowdown in late 2015. In 2016, growth was “exceptionally weak”, with average monthly clothing and footwear sales up 1% for the 10 months ended October 2016. However, For the period ended 31 July 2016, online fashion sales grew by 7.5% year-on-year, while store sales declined by 3% creating expectations for online sales to outperform the market, withgrowth of 9-10% in 2017. This demonstrates huge potential within the online fashion retail section of the market. The first thing to do is to determine what merchandise to sell. Visit local boutiques and malls to learn about local fashion trends. Visit industry publications online, such as Lucky, Style, Fashion Office, and Women’s Wear Daily, to learn about upcoming trends. Then research your target demographic and your competitors to confirm that your niche is a viable one. Look for any holes in the market, such as a lack of well-priced professional clothing, boutiques, vintage stores or plus-size stores. You might set your business apart from the competition by starting a boutique. Renting retail space outside of a mall may be much more cost-effective and offer you a better arena in which to compete. Boutiques, by their nature, offer a total shopping experience, with individualized customer service and fashion-forward sales people. Establish yourself as a fashion guru who can anticipate your customers' needs and outfit them with cutting-edge designs and styles that match their body type and personality. There were 192,000 VAT- registered retailers in the UK in 2016. The total number of retail outlets was 290,315 and the value of UK retail sales made £358 bn.The fashion industry around the world isn’t like any other industry presenting a continuing growth. Over the last years, there was an up and down. Now, the fashion industry in the UK steeps decline since 2009. But if you develop a strong market strategy and present solutions to the needs of your customer, you will be successful. It is better to select a business entity, such as a limited liability company, and register your business with your state's secretary of state. Obtain your business license, tax ID, and sales tax permit. Once you’ve established your business, attend trade shows. You should implement successful advertising measures. Send colorful postcards with details about your grand opening. Put out press releases. Once you’ve opened your doors, utilize monthly email newsletters. Get featured in local or regional fashion magazines. Then hold quarterly or half-yearly sales and after-hours events. How to research potential markets to ensure you have a business opportunity with potential, customer profiling, and market positioning, how to give your brand a name, how to write a basic business plan and raise funding for a business. Finance of fashion - paying the bills, legal eagles - legislation you need to know, engagement - professional practitioners you need to assist you, fashion markets and channels to find the perfect platform for your business position, where to locate your fashion business, online or bricks and mortar. Stocking Up, Buying and Merchandising - Researching trends and range planning, sourcing and managing supplier relationships, buying a balanced range; retail maths, managing OTB and interpreting sales data, seasonal buying activity, and link sales buys Setting Up Shop, Creating Your Fashion Retail Environment - Launching a transactional website from design to customer service, the changing business of fashion, how online retailing is changing our shopping habits, capturing the online market, SEO, and analytics, choosing a retail location and designing a retail space. The Big Sell, Marketing Your Business - How to use appropriate marketing media for your business, how PR can help your business - writing targeted press releases, social media - how to spread the word, Facebook, Twitter, Instagram etc, marketing - raise the profile of your business through selective marketing activity Sitting Pretty, Visual Merchandising & Display - Creating effective window and in-store displays using props and graphics, analyzing different VM techniques for optimum results, store layouts to maximize sales and encourage add on sales, finding display solutions for accessories and pick up items.